In a career that spans 30 years, includes eight No.1 singles and album sales reaching over 60 million, Daryl Hall and John Oates have become the most successful duo in music history - and they're not done yet. They were part of The Early Show Concert series. The duo performed their new single, "Man On A Mission" from their 21st album, "Do It For Love" as well as favorite hits. From 1977, they sang "Rich Girl" and from 1985, "You Make My Dreams." They told The Early Show co-anchor Julie Chen their 30 years together went by quickly. As for their music, it has evolved organically. Hall said, "We really did a lot of things in the beginning. We sort of created a song that was acoustic, folkie things from Philadelphia where we're from. We never really changed that. It evolved in its own way." Oates added, "There's a lot of our fans who like our more obscure stuff. We try to give them a little bit of everything." As for Oates new look? The reaction from the fans was "Shock and awe," joked Hall. Shaving his trademark mustache was a decision, Oates noted, on which he did not consult with Hall. "I am an independent man," he quipped. The two met 30 years ago while fleeing from a brawl. "When we were kids starting out in Philadelphia," Oates recalled, "Darryl's group had a record out, so did I. We were performing at a record hop," which he explains is "a teenage gang with dance. A fight broke out and we ran out the back door." They have been together ever since and both said that throughout those years there hasn't even been a whisper of a split up. Hall said, "We give each other a lot of space. Like any relationship, that's the best way to do it. We do solo work, take time off - not that much time off. We work very seamlessly over the years." Another 30 more? "Hey, you never know," said Oates. For now, "Do It For Love" is their first new set of studio material since 1997's " Marigold Sky." Done in the same rock 'n' soul tradition as Hall & Oates' enduring work, like the 1973's "Abandoned Luncheonette," 1978's "Along the Red Ledge," 1980's "Voices," 1982's "H2O" and 1990's "Change Of Seasons." "Do It for Love," released on Feb. 11, kicks off with "Man On A Mission." Hall said, " I think our mission now is to get it out there and to be honest. "The mission is to get outside the box. It's a very homemade kind of record. I think we followed our own instinct rather than listen to other people's suggestions. I think it's really a culmination of all the different stylistic directions we've gone in, and pulling it all together and focusing it in one place. It's a very organic record, it's emotional, it's got great songs and melodies -- all the things that people think of when they think of Hall and Oates are very much in evidence here." The album is titled after the song that became an unlikely No.1 Adult Contemporary hit. It was originally included on a compilation of greatest hits released in conjunction with Hall & Oates well-received episode of the VH1 series "Behind the Music." Thanks in part to a grass-roots push by manager Brian Doyle and some key support from Hall & Oates' dedicated fans who requested the song all around the country, "Do It For Love" became a major radio hit without the standard big push by a major label. 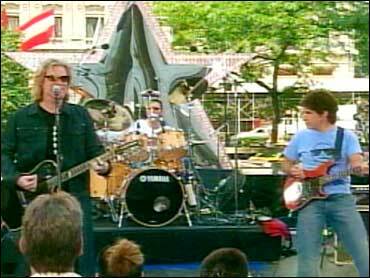 The surprise success of "Do It For Love," brought a whole new energy to Hall & Oates 2002 tour, including a successful summer run of concerts with the duo's long-time friend and associate Todd Rundgren. The "Do It For Love" album developed over the course of a few years. Initial sessions were held in London over two years ago and involved writers and producers responsible for numerous hits for artists like Cher and Enrique Iglesias. For assorted reasons, Hall & Oates eventually took an extended break from recording, before ultimately going back into Hall's studio in upstate New York for sessions that found the duo largely re-recording what they had done and recording new material. As they did so, they were working closely with their band, including longtime bassist and producer T-Bone Wolk, their returning "Voices"-era drummer Mickey Curry, as well as new associates like keyboard great David Sancious, known for his work with Peter Gabriel, Eric Clapton, and Bruce Springsteen. Oates recently released his own debut solo album "Punk Shui."